Fashion bloggers and tomorrow’s Posh Party hosts – Kathleen of Kat Walk SF and Caroline of Taste Bluebook – are cozying up to winter’s hottest trend: over-the-knee boots (OTK boots)! Read up on how these stylemakers take this glamorous look and wear it for daytime – along with other tips to stay fashionable through the winter. If you can’t get enough of their style, be sure to join them for their City Chic Posh Party tomorrow night! 1. What are your top wardrobe staples for San Francisco living? The weather in San Francisco is unpredictable to say the least. My wardrobe choices must include a chance of a 30 degree temperature variance. The key to dressing for unpredictable weather is layering. From your foundation pieces to your outerwear, SF style is all about layering it on. For me, this means a cami and knee-high socks to start. These pieces are crucial to staying warm and comfortable. From there, I add on a skinny jean, a chunky knit or silky woven, flat boots, a neutral scarf and a tailored coat. The key to true San Francisco style is to dress for any occasion and weather – and also, be prepared to add to it or take it all off at anytime! 2. How do you style OTK boots for a casual daytime look? 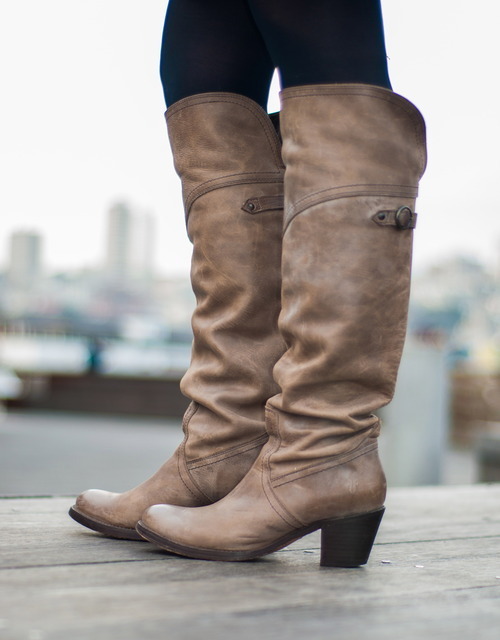 OTK boots can definitely be a challenge to style, especially for a daytime look. For this trend, it is always best to stay on the safe side, which means tucking a skinny jean into an OTK boot or wearing a knee length skirt to offset the height of the OTK boot shaft. Keep your daytime OTK look conservative and you will be good to go! 3, If you could shop one person’s closet, who would it be and why? I die for Sophia’s closet (@sophiaac)! From the classic Burberry trench to the white mini Pashli, she has got everything in stock that the “city chic” lady simply must have. Her style is timeless and classic with a side of sass (my specialty). 1. How do you cozy up to the OTK boots trend while staying warm? In the winter, I’m all about layering. It’s just too cold outside and too warm inside to dress only for one temperature – no matter how short your commute in a cold car might be! I never knew I was missing out on over-the-knee boots until I finally got them. Their versatility makes them the ultimate layering piece. My default is skinny jeans or spandex and boots all winter long – why not cover up a little more leg for enhanced style AND added warmth? 2. Where do you look for style inspiration? Instagram is so full of stylish individuals – bloggers and non-bloggers alike. It’s a great way to get a quick overview of someone’s style before trying to dig through a sea of blogs. IG also the added benefit of being an outlet for those who don’t blog but do share their style. 3. How are you refreshing your closet for the new year? I recently read an awesome article that talked about “new” essential wardrobe items. We all know that every woman needs a pair of dark wash skinny jeans (even if you only wear them with boots, like I do), a basic black blazer and the always-classic trench. While these closet essentials are staples for a reason, there are a few simple swaps that can add a bit of flavor and personality to your closet. While I kicked up my workwear collection with the addition of a leather pencil skirt, I like the idea of swapping out one of my basic silk button-down shirts with a loungewear-inspired (silk pajama) top or swapping out the tried-and-true ballet flat for a metallic oxford. Previous Post Oh La Love: Shop Simply Classic Style!